Rich with multi-layered history, Barangaroo is a dynamic retail, cultural and financial hub, with more than 50 per cent of the precinct offering extraordinary public spaces for everyone to enjoy. Nestled between the natural beauty of Sydney Harbour and the bustling global city of Sydney, the 22-hectare, $6+ billion development is a showcase of international design excellence, leading technologies, world-class sustainability, public art and cultural programs. At the northern end, Barangaroo Reserve is a six-hectare re-created Sydney Harbour headland. It offers an entirely Australian native garden, spectacular views, extensive walking and cycling trails, idyllic harbour coves, unique event spaces and peaceful picnic spots. In contrast, the southern end is a foodies’ paradise, only a few minutes’ walk from Wynyard Station. There are more than 30 restaurants and bars in this specially curated dining precinct. The laneways of Barangaroo are where contemporary architecture and the corporate world comfortably collide with the area’s maritime and industrial history. Between Barangaroo Reserve and the laneways in the south is the Central Barangaroo project area. 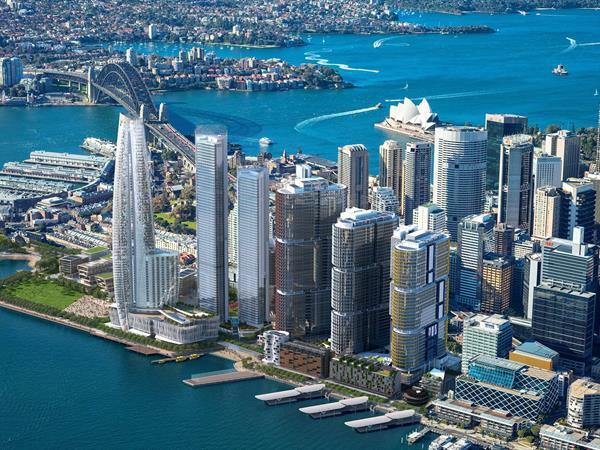 The successful bidder for the construction of Central Barangaroo was announced in January 2018. This area’s civic and cultural contribution is intended to be the beating heart of Barangaroo.